Just Property Kroonstad offers services for property sales, letting, holiday accommodation and commercial properties. We have a vibrant and energetic team striving to assist our clients with all property needs. Kroonstad is said to be one of the Free State’s loveliest towns and lies on the banks of the Vals River, a tributary of the Vaal, roughly two hours’ drive from Johannesburg. It is situated in an area characterised by open spaces and an abundant variety of vegetation that makes it particularly beautiful. Kroonstad is a quaint town that serves as a good stop over en route between Johannesburg and Bloemfontein, lying as it does at virtually the halfway mark. Kroonstad offers an array of activities that include flea markets, a tea garden, fishing on the Vals River or at the Bloemhoek Dam, walking trails and lion tours. Today, as an important administrative, agricultural and educational centre, Kroonstad still boasts much of the inherent rugged beauty which led the Voortrekkers to establish the town where they did. Leisure opportunities are plentiful in Kroonstad, where visitors can enjoy golf on the 18 hole course in the town and Sporting facilities of all kinds are well catered for as the headquarters of the SA Jukskei Council has been established here since 1951. 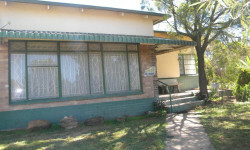 40 Murray Street, Kroonstad, Free State, 9499.